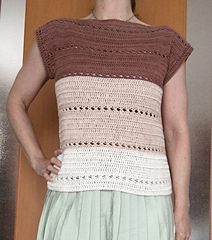 Striped sweater is easy to make everyday sweater with beautiful texture stripes. It is a bit loose to give the right amount of freshness. The short sleeve(just to cover the shoulders) makes it more comfortable and elegant. XXL - bust circumference 56” (142cm), length 26 ½”(67,5cm) It could be adjusted for bigger size. Enjoy 20% off when buying any 3 patterns with coupon code 3PACK. Enjoy 30% off when buying any 5 patterns with coupon code 5PACK. Enjoy 40% off when buying any 10 patterns with coupon code 10PACK.